China became involved in direct trade with Europe when the Portuguese established a trade center in Macau, China in 1557. Then, in 1565, Spain established a permanent colonial presence in the Philippine Islands and used it as a base for trading with the rest of Asia. France, the Netherlands, and Britain emphasized establishing colonies in the New World, but they soon followed the Portuguese example and began to trade directly with China. Wealthy Europeans were hungry for Asian spices, silk, tea, and ceramic products, and a trade imbalance quickly developed. In spite of the fact that the trade balance was clearly favorable to China, the Ming dynasty was distrustful of trade. The Emperor and the preponderance of his advisers generally took a xenophobic view of the world beyond China. In particular, they worried that foreigners would bring in ideas that would not support the authority of the Emperor, and that the foreigners would learn too much about the Chinese military and their fortress works. In 1644, the Qing dynasty gained control of most of China. The Qing were of Manchurian ethnicity and, for the most part, they utilized a Confucian-influenced political philosophy. The Qing were even less friendly to the merchant class, in general, and foreign merchants, in particular. In 1669, the Qing attempted to cut off support for Ming Dynasty loyalists by ordering the evacuation of China’s coastal regions. The move was bold, but ill-conceived. After a few years, the evacuation order was rescinded, but much damage was already done. As a result of the upheaval, many of China’s most skilled merchants, tradesmen, and educated citizens left China. After Great Britain’s victory in the 1757 Battle of Plassey in India, Great Britain strove to achieve a monopoly in opium production in India. Within twenty years, Great Britain had developed an iron-clad hold on Indian opium production. China soon became a market for the opium produced in India, and later Turkey. The British East India Company (“BEIC”) used a standard-sized chest for transporting opium to China. Each chest held 140 pounds of refined opium. Thanks to detailed tax records, we know that by 1773, the BEIC shipped over seventy-five tons of refined opium to China. In 2011, the street value of seventy-five tons of opium would be in the neighborhood of $140 billion, based on nationwide urban distribution across the United States and Canada. While it is nearly impossible to make an accurate economic comparison for opium sales between our current economies and the economy of 18th century China, we do know that the sale of opium to Chinese smugglers generated enough revenue to erase the trade imbalance that was moving so much European gold and silver to Asia. The opium trade was illegal in China. European traders avoided risk by trading their opium shipments to Chinese smugglers off the coast of China. The Chinese smugglers avoided risks by paying kickbacks to corrupt officials in China. 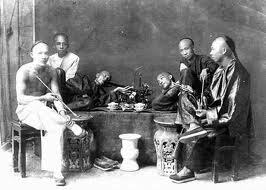 The effects of opium on Chinese society were highly destructive. Not unlike modern drug trade, the opium the BEIC produced in India and sold into China caused tremendous damage to the health and productivity of Chinese workers and a decay of the central government’s authority. Image by William John Huggins, public domain. The First Opium War began in 1839, when the Chinese government enforced a crack down on opium trade that included execution for Chinese drug dealers. The Chinese military boarded British merchant ships in international waters and destroyed their opium cargo. 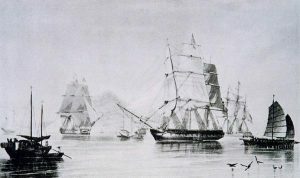 In June 1840, a British force from India arrived in China with superior warships, including a heavy steamship with heavy guns. Chinese ships were helpless against the British warships, and the British moved with impunity up and down the Chinese coast, raiding coastal areas at will. From Chinese spies in the employ of the British traders, the British learned that taxes collected in the Yangtze River region were transported to armored barges on the Yangtze River. The British inflicted a major economic blow on the Qing dynasty by sinking and capturing the tax barges. In 1842, the bankrupted Qing government sued for peace and signed the Treaty of Nanking with the British. The British received access to four trade ports and was given Hong Kong. China agreed to pay indemnity to the traders for the destroyed opium and paid an additional indemnity to the British government. British subjects were granted extra-territorial status in China. Basically, Chinese authorities could not touch British subjects in China. In 1844, China signed similar agreements with the United States and France. The Treaty of Nanking is seen by Chinese historians as the start of “the century of humiliation.” That century of humiliation ended with the defeat of the Japanese by US and allied forces in 1945. The First Opium War was hotly debated in Parliament. One famous British parliamentarian, William Gladstone, who was a new member of the House of Commons, spoke eloquently against the war on moral grounds. But before the ink ever dried on the treaty, the Chinese Imperial Court was already devising strategies for evading the treaty terms. The conflict was bound to reignite. Next week, we will take a look at the Second Opium War. Late to the party but this is good information. The roots of both narco-terror and state-sponsored narco-trafficking are amazing. And so now we have hyper corruption in the USA, ESPECIALLY AT THE BORDER, as Billions in drugs come from various countries thru our southern border, and US Ports. Result. A country with drug addiction of epic proportions and the associated crime that comes with it.